Mridhul is a 15 year old boy (10th Standard) who by dint of ill fortune is inflicted with Chronic Kidney Disease. He is suffering from end stage (G5 category) Renal Disease caused as a result of Reflux Nephrology. He is from a very poor family. His mother is the only earning member in the family, while she works as a house cleaning servant to support her family of 3 members including an ailing Mridhul and his little sister who is suffering from Autism. 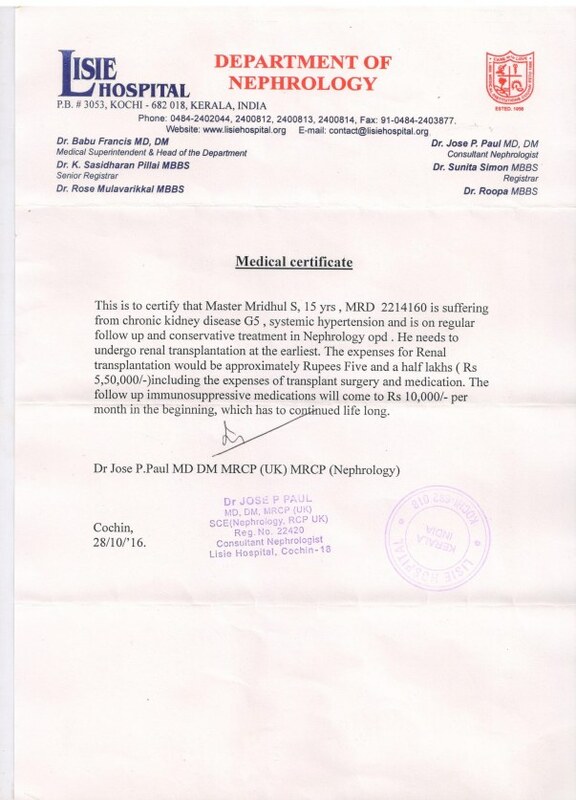 Master Mridhul requires an immediate Kidney Transplantation to save his life. The treatment is going to be done in Lisie Hospital, Kochi, under the supervision of Dr. Jose P Paul, M.D., D.M (Nephrology) and Dr. Babu Francis M.D., D.M. The total estimate of Renal Transplantation with essential post operative medicines is Rs. 5.5 Lakhs. The operation is held on December End and Just because of lack of money the date is not yet fixed. 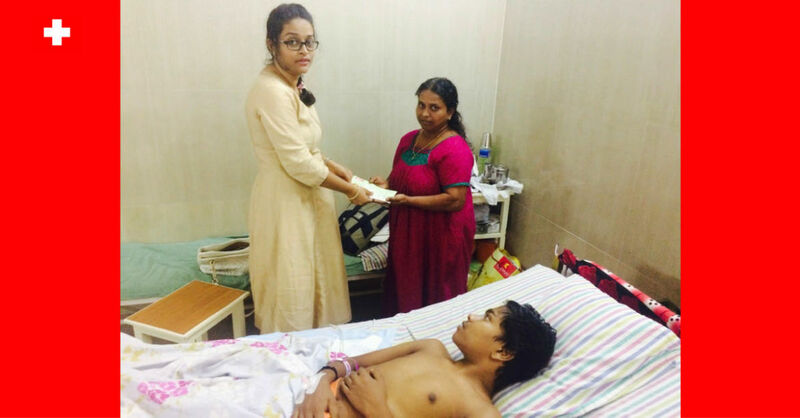 His mother is not in a position to bear the whole expenses of her child's operation and she is donating her Kidney for the long and healthy life of her son. This mother requests everyone with a tearing eyes for the help and support to save the life of her only son. Dolly Benson, the Managing Trustee of V Save a Life Foundation, handing over the Cheque to Mridhul’s mother for his Kidney Transplantation Surgery at Lisie Hospital, Kochi. We use this opportunity to thank all Donors those who supported for this Mission. Special thank to Milaap for providing us a great platform to support our missions. As Mridhul's mother herself has donated her own Kidney, both required medication for at least 3 months, so we request you to support more. We thank you for your wonderful support for our dear Mridhul. The operation is fixed for Jan 16th, 2017. Operation amount is not yet arranged completely and the date that doctors given is maximum they can do for us to arrange money. Mridhul's condition is critical. We request you to spread the word and support ! Thank you.